I'm no big fan of reunion shows and already saw Youth Of Today in 2000 or something like that. Still to see Youth Of Today perform in the venue were I saw my first real hardcoreshows is special. 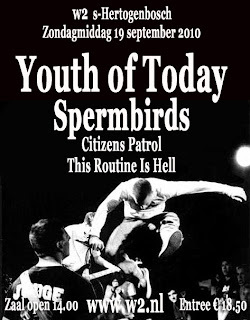 And it doesn't hurt that two of the best Dutch bands around right now are on the bill as well: Citizens Patrol and This Routine Is Hell. I read somewhere that Tim 'Mouthpiece, Hands Tied, Double Cross' McMahon designed some new Youth of Today shirts for this tour so I'll check those out as well. Cool show, up to Amsterdam tonight! I'm going to skip Amsterdam. Have fun though! Well, that was really a great show, better than Den Bosch actually.